My mom and I were thinking of ways to help my son get through the time I’ll be away and she found our website on google. 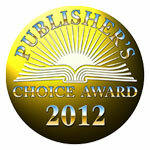 I can’t express how happy I am that I found your site and that you are extremely quick with turnaround times. Thank you so much! Click here to read more from our fans. Summer sleep-away camp. Mommy or Daddy at work. Parents’ military deployment. A Grandparent’s home. Preschool to College. It can be hard to be a kid today, because sometimes families have to leave one another. And when that happens, Huggee Miss You™ will be there so your child or young adult will still be able to have you with them. 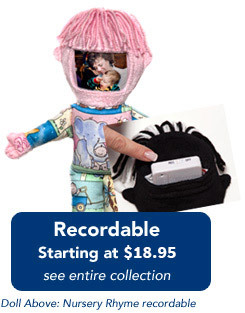 One of our favorite parts about our HMY recordable dolls is that they’re easy to use. You can record a custom, 10 second message in person OR over the phone or Internet! With HMY, being away from your loved ones won’t stop them from hearing your voice OR seeing your beautiful face whenever they want. With HMY distance does not matter as now they can see and hear you! HMY can record messages you have saved on phones/answering machines or any other device. Now you can actually save your precious message and hug them with no fear of losing their voice. We ship our products within 24 hours of receipt*, for no extra charge. We also ship to APO, AE, FPO Boxes (we ship to all, military and standard international orders), so sending gifts overseas is never a problem and always our pleasure. 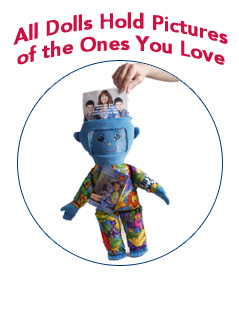 The HUGGEE MISS YOU™ photo doll has helped keep hundreds of thousands of parents/grandparents/young adults and children stay connected by allowing everyone to put a gorgeous picture in the pocket over our cute embroidered face and to leave messages too! NO MATTER WHAT AGE OR GENDER we ALL have someone we MISS and wish to hug or hear. 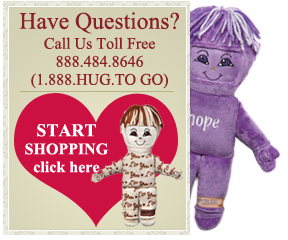 Our goal is to keep all loved ones connected with a HUGG AROUND THE WORLD! 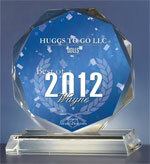 We not only offer these HUGGS at amazing quality and fantastic pricing! 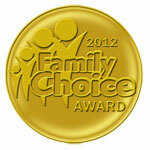 ALL our HMY’S are Hypo-Allergenic, Spot Cleanable, Color Fast, SAFE FOR ALL AGES! 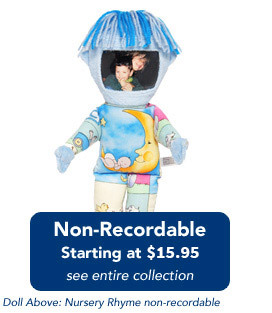 Our Non Recordables are MACHINE WASHABLE!! Delicate cycle-cold water in pillow case to protect “hair” and fluff dry in dryer!! You can also WRITE with a fabric water proof marker on your HMY’s your loved one’s name, #1 Mommy/Daddy/Grandparent – I Love You etc. HUGGEE MISS YOU makes staying connected fun and easy! What kind of Huggee are you? 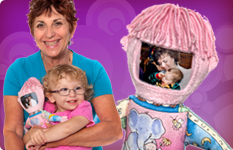 Our original cloth dolls can be customized by design and sound, too! 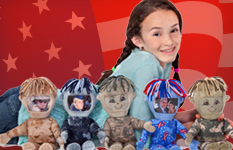 For more information about shipping our recordable dolls across the nation or across the sea, CONTACT US today! *Does not include overnight shipping, all orders are shipped First Class or Priority Mail (unless ordered otherwise). We do not ship on weekends or holidays.